Heat a heavy-bottomed pot on medium-low heat. Add the butter and let it melt. Add the rice into the pot and stir to coat with the melted butter. Cook for 1 minute. Add the coconut milk, water, cream of coconut and evaporated milk. Stir to combine. Add the vanilla, ground cloves and pumpkin pie spice. Whisk to combine the spices. Add the raisins and stir to combine. Lower the heat on the pot to low. Cook the arroz con dulce for 60-75 minutes, stirring constantly to prevent the rice from sticking and burning. 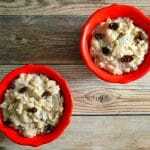 It's ready when the rice is very tender and the mixture is very creamy. Most of the liquid will evaporate, but it will still be pourable. Pour the arroz con dulce into a heat-proof dish, and cover with plastic wrap (make sure the plastic wrap touches the surface of the rice pudding, to avoid forming a skin. Refrigerate for 8 hours, or overnight. To serve, you can scoop portions into cups, and top with a pinch of ground cinnamon/pumpkin pie spice, if desired. I love using pumpkin pie spice for this recipe, because it contains all the spices you would use for arroz con dulce. Some folks like to use whole cinnamon sticks, fresh ginger and whole cloves, but I like the more subtle flavor profile that ground spices provide.